Of course, there have been rumors for quite some time and even a few panels scanned to the internet that purported to be from today's Amazing Spider-Man #700--but until now, nobody had actually held a copy in their hands and been able to flip to the end and say out loud whether those "spoilers" were on the level or not. An event nearly 100 issues in the making, outgoing Amazing Spider-Man and incoming Superior Spider-Man writer Dan Slott has told fans and press that anyone who spoils the comic before Boxing Day would be on his own personal version of the Naughty List forever. And you don't want to make Dan Slott angry--you wouldn't like him when he's angry. Is that enough room for spoiler space? Especially with that headline? As most had suspected for some time and those scanned spoilers confirmed, The Amazing Spider-Man #700 gives birth to a new Spider-Man in the form of (a reformed) Otto Octavius (Dr. Octopus), whose mind is now inhabiting Peter Parker's body and has access to its memories. Peter, meanwhile, ended his fifty-year run as The Amazing Spider-Man by dying in Otto's/his own arms while inhabiting the withered husk of Octavius's body. "This is Moriarty in the head of Sherlock. This is Prince John inside of Robin Hood. 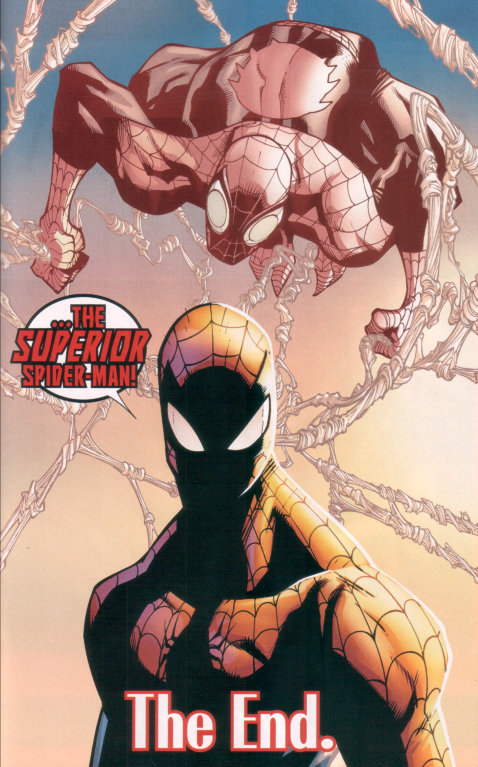 This is the greatest villain inside the body of the greatest hero and trying to do good," Slott told USA Today. This, of course, sets the stage for Slott's upcoming series Superior Spider-Man, which launches next month with art by Ryan Stegman and a rotation of star Marvel creators. The new costume, which debuted in Daredevil #21 last week, can be seen in the background and above Spider-Man at right, and features elements of Dr. Octopus incorporated into the classic design (see how the spider on the back seems chubbier than it did under Pete? And those goggle-looking things in his eyepieces? ), as well as some other tweaks that are meant to make the character simply look more menacing (the pointy fingers, the more animalistic look to the costume in general). And while he'll reportedly be a more brutal, unforgiving Spider-Man, the creators involved promise that he'll still be Spider-Man. "It's also what the good part of our first year of Superior is about: Doc behaving in a manner he's not accustomed to. We see a more sympathetic side of Doctor Octopus," said series editor Steve Wacker. "We couldn't have a Spider-Man who was running around murdering people. And I have no interest in seeing that sort of character win." "This is a guy who was a couple steps way from a bucket list, and now he's got a whole new lease on life. That's really going to change him," Slott explained. He also said this gives the creators an opportunity to explore a different kind of stories that you can't do with Peter Parker, because Octavius will be learning the lessons that Peter already figured out ages ago. "Peter Parker was selfish and horrible for all of part of one story. From then on, we've seen him be a hero," Slott said. Doctor Octopus "has a lot to overcome, and on some level, that road of salvation and stepping up and doing the right thing, it's more interesting to see it from a character who has to fight his basic nature to do that." The writer also suggests that there's a whole different audience who can relate to Octavius, who has always been depicted with a non-traditional superhero body and who, backstory has shown, had the problems of growing up like that. "Doc is kinda like me: He's short and schlubby. This is a guy who now gets to be in the body of Peter Parker. This opens up whole new things," said the writer. Meanwhile, of course, there has been a lot of pushback on the readership since the spoilers for this issue leaked on the Internet. While Slott cautioned fans to wait and read today's issue in context, some of the early reviews suggest that in context, longtime readers will only be marginally more pleased with the finished product. The writer, apparently, is ready for that as well. "He had to be a hero in his own eyes, and on some level Otto Octavius is facing that struggle not with Spider-Man's world but with the readership," Slott told the paper. "How do you get more Peter Parker than that? Now the readers think he's a menace. That's exciting. On a meta level, that is Spider-Man." What do you think of Doc Ock as Spider-Man? Chime in below, or on our Facebook and Twitter pages.